It’s eCLASS Showtime for White Oak Elementary School! On March 29, White Oak Elementary School hosted educators from across the district for a schoolwide eCLASS visit. Billed as “Going Live with Inquiry- and Project-Based Learning” the event offered an exciting opportunity to observe 21st century learners— students fully engaged with technology tools and peer collaboration— working in their classrooms, the many collaborative spaces, computer labs, media center, and maker space while actively (and confidently) presenting what they’ve learned. Driven by a question or problem, an inquiry-based lesson encourages collaboration, makes kids into explorers and discoverers, and requires kids to think more deeply about their work, while teachers facilitate the learning. Inquiry is a process for learning the district’s Academic Knowledge and Skills (AKS) curriculum. Students are encouraged to begin by wondering about the content, then collaborating, formulating questions, investigating to find answers, building new understandings, and communicating their learning to others. 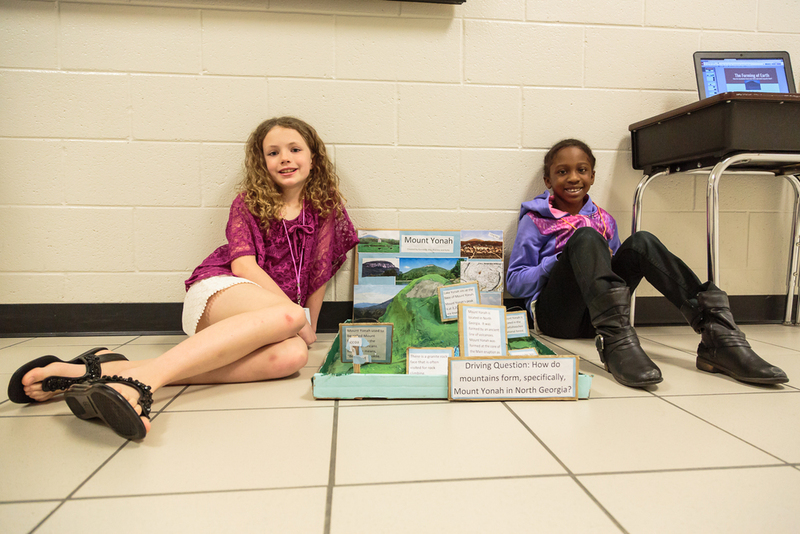 Thanks to this instructional approach, White Oak recently achieved Georgia’s schoolwide STEM (Science, Technology, Engineering, Mathematics) Certification. State Superintendent Richard Woods visits the school for the formal award presentation on April 22. White Oak is the first elementary school in GCPS to receive STEM Certification. Gwinnett School of Mathematics, Science, and Technology and the Center for Design at Technology (CDAT) at Lanier High School also hold state STEM certification, while Harbins Elementary School and Peachtree Ridge High School currently are pursuing the state designation. Peachtree Ridge also holds STEM certification through AdvancED, an international education accrediting agency. 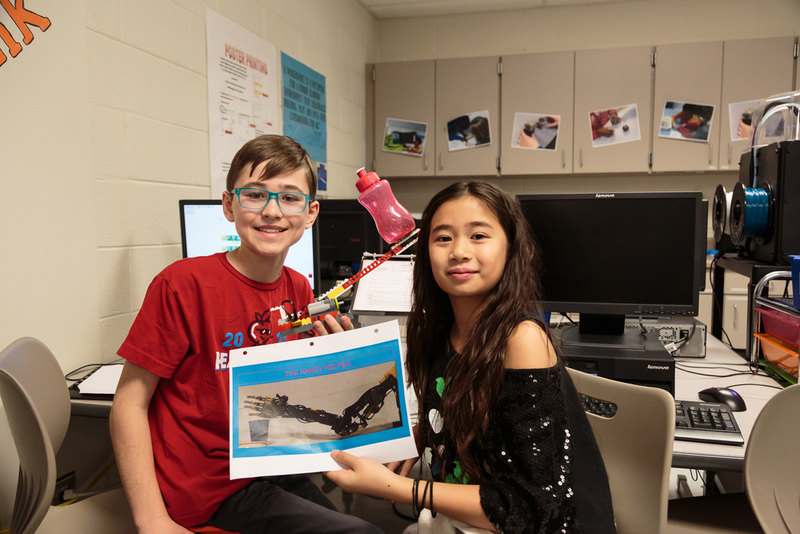 Check out this photo gallery to see how White Oak students are combining inquiry- and project based learning with technology to master GCPS’ AKS curriculum. White Oak students write code to complete tasks, create, and explore. A group of 2nd grade students researched and set up different growing stations to test variables that affect the growth of pea plants. …then, charted the impact of variables on plant growth. “I noticed that [the plant exposed to] red light has a lot of leaves, sunlight has a dark green stem and leaves, and indirect light is like really tall,” says Ava about how light affects growth. Through the Design Theory process, students create a simple machine to solve a problem, says assistant principal Stacey Pickett. “The students built their own prototypes, and they’ll be presenting their projects to the students,” using the Shark Tank model. Projects that get the green light from their peers will be developed further. 4th graders Justin and Vanessa used an inclined plane, a pulley, and a hook in their project, called Easy Box. “Basically, we’re trying to end the days of you getting hurt while trying to get a box upstairs, or valuables in the box breaking,” says Justin. Future electrical engineer Noah (right) and partner Chase, both 4th graders, designed “The Rever,” a lever to turn off the lights from the comfort of bed. “We don’t like getting out of bed [once comfortable]… to turn off the light. And then you come back and you can’t get comfortable again,” says Noah of their inspiration. This group of kindergartners created a project involving facts about the moon. The children incorporated a quiz for viewers of their presentation and an animated video featuring lunar facts. A group of 5th graders— Andrew, Hunter, David, and Evan— worked together on a project to increase cardiovascular endurance. The group tracked their workouts, identified exercises that helped them to increase their scores, and created their own videos to support the workout plans that were most effective. They all agreed that they enjoyed working with each other and pushing themselves to do better. Corey, a 3rd grade and history enthusiast, enjoyed researching her project on the Underground Railroad. “What I enjoyed most was finding the information with the books and with the BrainPop video because I really like learning about history.” she says. Students Bella, Kira, Carrington, and Tristan worked as a team to depict the lives of plantation slaves. The students recreated tools used by slaves, built a replica of slave quarters, and a created a learning game to show the items slaves invented to improve their daily lives and to accomplish tasks more efficiently. A group of 2nd grade students took turns using a tablet acting as a remote control to guide a motorized robot ball through a maze of wooden blocks. “The speed and the power made it pretty hard,” says Cody. Carter and Isabel, both 4th graders, explained how they (with teammates Braden and Anthony) designed a bottle to make drinking beverages easier for individuals with disabilities and for small children. The group built a motorized prototype using LEGO bricks and powered by code written by the students. Based on the performance of the prototype, the group is planning to add a stronger motor and make changes to measurements as they develop a market-ready version.